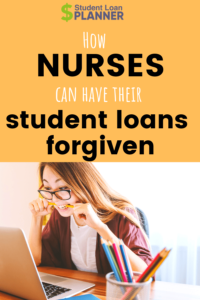 Public Service Loan Forgiveness for Nurses: Is It Right for You? Usually when I hear about someone’s decision to pursue a career in nursing, it isn’t about the money, and it’s not because it’ll be easy. It’s because they have a passion for helping people, and I’m guessing the same is true about you. But, in order to get hired in the field, you need to get the right degree, which for most people comes with some hefty student loans. According to Glassdoor, the average base pay for a registered nurse is over $65,000. That might not sound too bad until you find out the majority of nurses graduate with $161,000 in student loan debt. When your loans are almost 2.5 times your earnings, creating a plan can seem like an impossible task. While this can be frustrating, there are many options available when you spend some time creating a plan. One great option frequently available to nurses is Public Service Loan Forgiveness (PSLF). The PSLF program is a way of saying “thank you” to those providing a much-needed service to make the world a better place. You make payments for a certain period of time, and whatever amount remains afterward is wiped away tax-free. Although there aren’t many requirements, they have a tendency to trip people up. If you don’t get it just right, you could end up paying on your student loan for years only to find out that you still aren’t any closer to qualifying for PSLF. So, let’s dive into a few more details about these requirements. Make sure you don’t refinance your student loans to private loans after graduation — or anytime after — if you’re planning to work toward PSLF. Friends, family and coworkers may try to convince you it’s the right thing to do if you can get a lower interest rate. But if you’re working toward having a portion of your loan balance forgiven, you need to stick with Direct Federal Loans. If you have federal loans that don’t say Direct in their names, then you might need to consolidate your loans. This means you must make 120 payments that are paid on time. It’s okay if the payments aren’t consecutive. As you begin working, it may take a while to find the right job for you. If your job doesn’t work out, that doesn’t mean you have to abandon PSLF. If your next place of employment is a qualified employer, you can pick up where you left off. You have to make 120 payments total. These plans will help lower the total of your monthly student loan payment. That means you won’t be able to pay them off within 10 years, allowing you to take advantage of PSLF. It’s important to note that your IDR plan will need to be updated every year to see if your income has changed. If you forget to do this, your loan repayment will be set back to the Standard Repayment Option until you reapply and are approved again. Not every job you get as a nurse will qualify for PSLF. Your employer needs to be a 501(c)(3) nonprofit or a government organization in order for you to have your loans forgiven. There are a few exceptions for other nonprofit organizations based on the types of public services they provide. You also need to work a minimum of 30 hours per week. These hours can be with one employer or split up between several. However, each employer needs to qualify in order for the time to count. What other repayment and forgiveness options are available? PSLF isn’t the only repayment option for nurses, but these other options come with strict requirements. We won’t get into all the details of these programs, but here are some of the basics. One of the requirements to qualify for this program is you need to be employed at a Critical Shortage Facility located in a high-need area. As of 2019, this program is no longer taking applications, but it could reopen in the future. There are several repayment options for those that have served or plan on enlisting in the military. The details and programs vary based on the branch of the military you enlist with, so make sure to compare your options. This option only exists for those who received Perkins Loans while they were active prior to September 2017. Under this program, in exchange for five years of full-time qualifying work, you could have the full amount of your loans forgiven. There are many states that offer programs to assist nurses with student loan repayment. You can find more details about the states that offer programs here. Is PSLF for nurses right for you? Before deciding to pursue PSLF, you need to make sure it’s truly your best option. This means comparing all of your options, including working for a private practice that might be able to provide you with a higher income that will let you pay off your loans faster. If you want to talk with a student loan professional to see if PSLF is your best repayment option, schedule a student loan consult today. 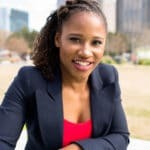 Lauryn Williams, CFP® is a consultant for Student Loan Planner and the founder of financial planning firm Worth Winning. She graduated from the University of Miami with a Bachelor's of Finance. Lauryn is a 4 time Olympian and the first American woman to medal in both the Summer and Winter Games.